I really love nachos, always have, always will. Nachos are one of those snacks that take a little bit longer to throw together than some other snacks, but I find that the extra effort pays off in how satisfying these nachos are. I love to make my nachos loaded, none of that melted cheese on corn chips dipped in salsa business, I want all the toppings. The thing about nachos is that it is a snack that you can tailor to your own taste. I love olives, so I like to add olives to my nachos. The day that I made these nachos, I wasn’t in the mood for spicy, so I decided to omit jalapenos. Once you have decided what toppings you want, making the perfect nachos is all about layering. A layer of corn chips followed by all the toppings, followed by another layer of corn chips, followed by all the toppings. Just repeat these layers until you have a tower of nachos. Throw them in the oven for a few minutes to melt the cheese and voila! Over medium-high heat, heat olive oil and crumble ground turkey. Cook turkey until fully cooked and add in 1 tbsp of taco seasoning. Remove from heat and set aside. Meanwhile, prepare sour cream. Mix 1 tbsp of sour cream with 1/2 tbsp of water and 1/4 tsp of taco seasoning. Set aside. Now, on a baking dish, put a layer of corn chips, followed by half the shredded cheese, 1/2 the ground meat mixture, 1/4 cup of salsa, 1/2 tbsp of the sour cream mixture and 1/8 of a cup of chopped olives. Follow by another layer of corn chips and layer on the remaining ingredients. Put nachos under the broiler for 2-4 minutes or until cheese is melted. 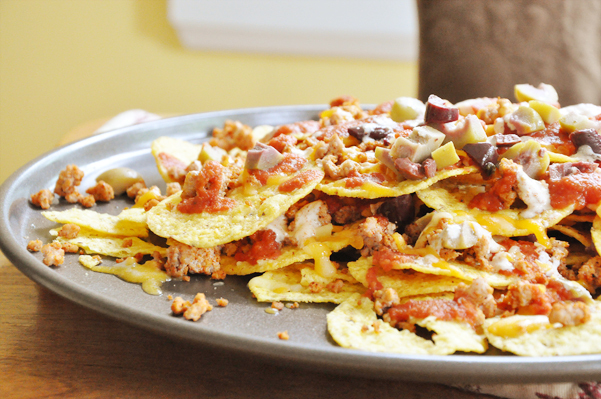 These loaded nachos make the perfect after school snack, or snack during sporting events.